Citrine is a silicon dioxide mineral, a member of the Quartz group, it’s crystal system is trigonal and it’s yellow pigmentation is derived from iron. It varies in shade from very pale yellow to a deep amber, nearly orange, with some specimens exhibiting brownish tinges. The name Citrine comes from the French word citron, meaning lemon. Citrine was used as a gem in Greece and Rome through the first and second centuries A.D.
Much of the commercial Citrine on the market is heat-treated Amethyst. In general, the deep amber and orangish shades are heat treated. Natural Citrines are mostly a pale yellow colour. 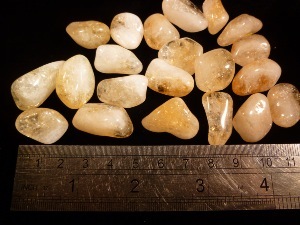 Deposit of natural Citrine have been found in Brazil, Africa, Madagascar, Spain, Russia, France, Scotland and the USA. Natural Citrine is said to assist one in overcoming difficulty, maintaining effort through adversity, and taking decisive action to resolve difficult situations. It may assist one in overcoming feelings of being undeserving of abundance. Physically Natural Citrine is considered to enhance physical stamina and energy, support the endocrine system and encourages proper metabolism. The more available variety of Citrine found on the market is the characteristic lemon-yellow to orange-yellow stones created by heating Amethyst crystals to a high temperature. Crystals and minerals are use to high temperature within the Earth, so this heating does not damage them. Though in many ways these stones should be considered a different mineral, in regards to their healing and metaphysical properties. Some people will refer to Heat Treated Citrine as ‘Common Citrine’ not the most flattering of names and I would say a calling it ‘Warm Citrine’ would suit it better it my opinion, as it is said this type of Citrine may bring a light to dark thoughts and bring an optimism, playfulness and happiness into one’s energy system. To me this is bringing a warmth and a comfort to ones self. It is considered to enable one to be more assertive and outgoing and it may also give a ’second wind’ to face difficult situations. Physically it may be helpful for digestive issues and metabolism. It may also be used to support weight loss and to increase energy during exercise. 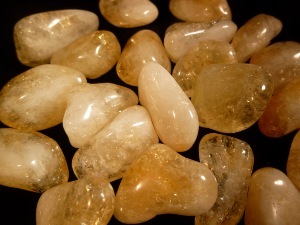 Citrine tumbled to a smooth finish, an ideal pocket size stone, small enough to carry around with you. Tumble Stones can also be placed around the home for their energies or can just be nice decorative items. Heat Treated Citrine crystal gemstone of varying sizes selected specially for your order.